At Opto4u, we specialize in producing photonics tools. Optomechanics is a category that includes optical tables and breadboards, optical mounts and mechanical devices fully compatible with our range of optics. 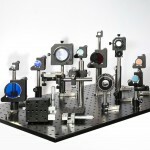 We offer a large variety of in stock optical lab equipment. Thanks to our 30 years of experience in the optomechanics and optical fields, our Opto4u's team have selected for you the most representative components in each categories. An Optical Mirror Mount is a device used in optics research that securely holds a mirror in place while allowing for precision tip and tilt adjustment. Position your optical component with ease where you need it by taking advantage of our selection of optical mounting posts and holders. An optical table is a platform that is used to support optics experiments and engineering. Optical tables are heavy and may use legs that act as a low-pass filter to vibrations.